Posted March 15, 2017 by San Luong & filed under . You can’t say you have had a taste of Saigon if you haven’t experienced stopping at a small food stall and order a local dish. Street foods take a special part of my childhood memory, and are truly the essence of Saigon’s cuisine. 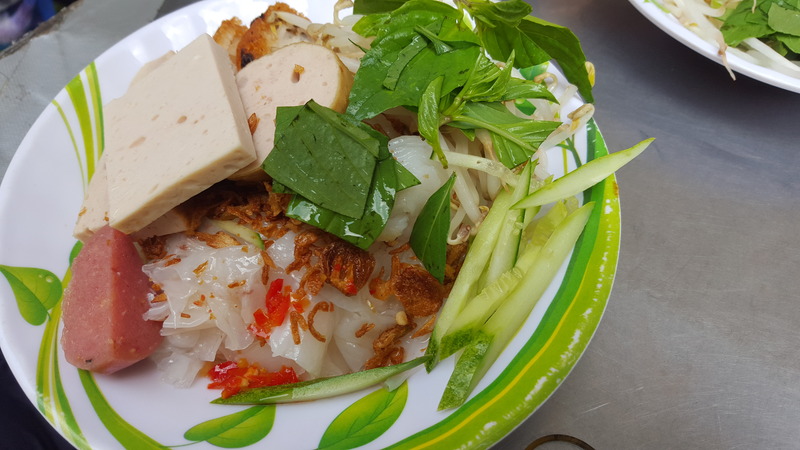 In this post I will introduce three very popular street foods that you definitely need to try out when visiting Saigon. Bot chien, for me, is a special nostalgic kind of food. It is my favourite childhood snack. When I was small, very often in the evenings, my mom would take me out to the bot chien food stall nearby and we would share a plate together. Even now when I have grown up and lived far away, every time I come back to Vietnam, I must go there to enjoy a plate of bot chien and to visit the owner as I already see him as a dear neighbor who has been watching me growing up from a little girl to a young lady. It’s been more than 15 years and the quality of his bot chien never disappoints me. Bot chien is the little golden fried cakes that are made of rice flour and tapioca starch, fried with an egg or two on a big flat pan and served with soy sauce dipping. The cakes start out white in color, and when fried in a generous amount of oil, they begin turning to the golden crispy goodness. When they are almost done, a couple of eggs will be cracked and let sizzling until it becomes an omelet that wraps around the cakes. And as it’s not yummy enough, a handful of sliced green onions, some pork fat cracklings, and a very good dash of ground pepper will be added for extra flavour to finish it off. When bot chien is scooped out onto a plate to serve to the hungry guest, shredded green papaya will be added on top as well, along with a small bowl of dipping sauce. The cakes are crispy on the outside but smooth and starchy on the inside. The eggs are tasty with a strong hint of fried green onions. And the green papaya just adds more crunchiness to the dish. You can dip the cakes in the sauce or just pour the entire bowl of sauce onto the plate and enjoy the perfect balance of sweet, salty, sour and even spicy if preferred. It is simply awesome. 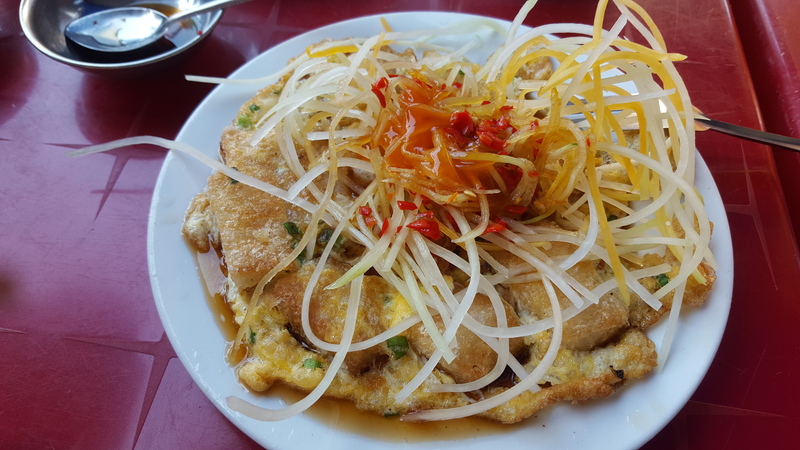 Banh uot is a dish that is comprised of several thin, wide steamed rice sheets and Vietnamese ham (cha lua), fried prawn cakes, fried shallots, fresh herbs, sliced cucumber, beansprout, lots of crushed chilli and served with dipping sauce (nuoc mam). Woo, I have always thought it was a simple dish until I listed all the ingredients just now! The main star of the dish is the extremely thin and delicate rice sheets that is made by steaming rice flour batter on a cloth that is stretched over a pot of boiling water. When the sheet is cooked, which is in less than a minute, people usually use a bamboo or wooden stick to lift it off the fabric and place it onto the plate. This is an extremely delicate technique that requires lots of practice to master. When all the sheets have been placed out, it will be top with the other ingredients that are already prepared/sliced up beforehand. To enjoy it, pour a generous amount of dipping sauce onto the plate, take a little bit of everything with a pair of chopsticks (make sure to get all the herbs and veggies too because it’s healthy for you), and put it in your mouth, chew, enjoy, chew a bit more, enjoy a bit more, then swallow and repeat. A close cousin of banh uot is banh cuon, which is basically the same rice crepes but are filled with ground pork and wood ear mushroom mixture. It is also served with Vietnamese ham, fried prawn cakes, lots of shallots and herbs. Very very delicious. Banh uot and banh cuon are both light breakfast dishes that are just perfect to start the day with. 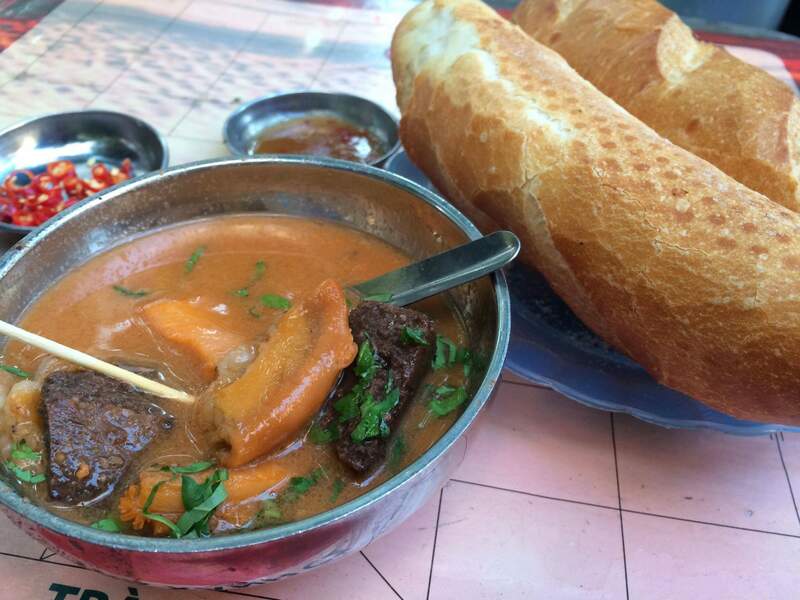 Pha lau is one of the truly exotic foods in Vietnam that probably is not the cup of tea for most of the foreigners. But I still want to introduce it for those who are feeling adventurous because it is a dish that really brings out the essence of Vietnamese cooking that turns cheap ingredients into something that tastes amazing. Pha lau is a dish made from cow’s or pig’s intestine, anything, everything, from heart, liver, tripe, ears, stomach, honeycomb, etc. that are stewed long hours in a broth containing coconut syrup and various spices, namely Chinese five spice, curry powder, lemongrass, annatto oil and some fish sauce. The intestine are carefully cleaned before cooking using cooking wine, vinegar, salt or lemon. They are then marinated in spices; after that they are fried and then stewed. When served, they will be scooped onto a bowl with a loaf of Vietnamese baguette and tamarind fish sauce on side. The broth is a little sweet, the sauce is a little sour, and together with the spices, the whole dish is an explosion of flavour. I couldn’t stop eating until I got to the last bit of the broth. It is that lip-smacking good! It is one of the most popular street snacks amongst young people. Dare to try it, you will love it. I really love your bread posted on Youtube. The bread is so good. 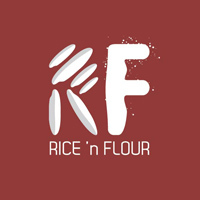 Do you have any recipe for Vietnam bread, (the Manh Bin? I went to Vietnam and attend a class teaching the Vietnam bread (Manh Bin). I really enjoyed the trip. I would love to go back one day. When i came back to USA and tried to make it, it does not turn out right. I cannot get the thin crispy crust and the soft feather-like crumb.